Take to the Skies, Before the Skies Take You! 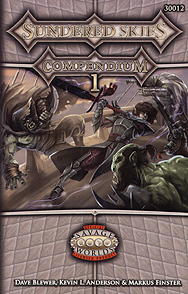 Sundered Skies: Compendium 1 contains 4 thrilling adventures full of peril, horror and madness. A shattered world. A thousand floating islands. A constant glow of madness. The heroes travel to the artic wasteland of the Draining Sea. There they must contend with the elements, savages, and zealots if they hope to pillage the ancient resting place of The Battlelord. Travelling all over the skies, our heroes attempt to recover cursed salvage causing mayhem and madness. Can they hope to solve the mystery of the lost skyship, The Summoner? A find on a forgotten island out in the void sets in motion a series of events which sends the heroes to the hottest depths of the Skies, as they seek to save the soul of one of their number. Can they cheat fate as they struggle against The Blade of Destiny! In a bid to raise morale and emphasize the links between the islands, the Trade Council sponsors a competition. Intrepid captains and their crews must navigate their way between the major islands. The ships crew, which completes the race in the shortest time, will win fame and fortune across the known skies. But first they must survive, monsters, pirates, glowmadness, treachery, conspiracy, the tactics of their fellow competitors.